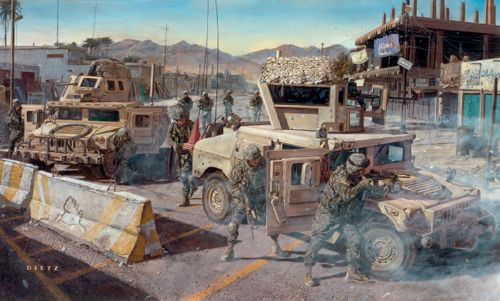 James Dietz Handsigned and Numbered Limited Edition Print:"On Any Given Day"
Size: 25" x 15"/ Overall Size: 31" x 21.5"
About the Art: The Paratroopers of the 1st Battalion, 505th Parachute Infantry Regiment, 82nd Airborne Division deployed in August 2006 to Salah Ad Din Province, Iraq in support of OPERATION IRAQI FREEDOM. Based at FOB Summerall, near the key city of Bayji, they engaged in sustained combat operations for 15 months and then redeployed to Fort Bragg, North Carolina in October 2007. The Task Force 1-505 area of operations-known as AO Spartan-included the Iraqi towns of Al-Butoma, As-Sariyah, Bayji, Bushwari, Mezra, Sikek, Siniyah, and a host of other villages and settlements. Also included in AO Spartan was the Bayji Oil Refinery, the largest refinery in Iraq both in size and production capacity. Day after day, 1 Panther Paratroopers boldly patrolled the dusty streets of these communities in order to provide security for the local population and also to eliminate insurgent presence and influence among the people. This print shows what often could happen-and usually did happen-on any given day in AO Spartan. These Paratroopers detect something to their left, perhaps an explosion or burst of small-arms fire, and they take up an alert posture of ready response. Visible in the background is the ornate minaret of the Al-Fatah mosque, the ever-burning flare stack of the Bayji Oil Refinery, and the prominent Jabal-Makhul mountain range. The Paratroopers of 1-505 have courageously represented the United States of America in combat across the globe for nearly seven decades, and their audacity in the face of the enemy is legendary. Even now, they stand ready to execute whatever orders they receive-on any given day. Airborne! All the Way! H-Minus!